TIMBER outfit Eksons Corp Bhd is planning its next property project in the Klang Valley to drive up earnings, its director Tang Seng Fatt said. Currently, contribution from property projects to the group is less than 5 per cent and it expects this to hit 20 per cent next year, Tang said. The potential growth is attributed to its on going joint venture project, The Atmosphere, a RM850 million mixed commercial development in Seri Kembangan, Selangor. "The project is being developed in phases, so we will have RM40 million to RM50 million coming in every year," Tang told Business Times at a media briefing on the project in Kuala Lumpur yesterday. For the year ended March 31 2010, Eksons posted a net profit of RM28 million on revenue of RM279.1 million. The Atmosphere is the first commercial development in South Klang Valley to be certified with the coveted BCA Green Mark Certification (provisional). The 21ha leasehold project is being developed in three phases and it is expected to be completed within 5 to 8 years. Eksons' stake in the project, launched in August last year is 60 per cent. Tempo Properties Sdn Bhd holds 40 per cent. "We will continue to work with Tempo as joint venture partners and project managers. We are looking for land in the Klang Valley and will ink a deal soon," Tang said. Tempo, though not part of Eksons, is deemed a related party to the group, given certain common shareholdings between both companies. 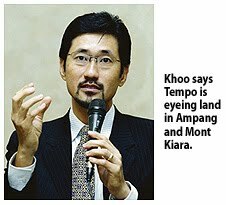 Tempo chief executive officer Khoo Boo Hian said it is eyeing land in Ampang and Mont Kiara. He also said the company expects a return on investment of up to 25 per cent over the next three to four years from The Atmosphere. Upcoming properties at The Atmosphere include retail and small office/home office (SOHO) units. They are due for launch by early next year. By end-2011 or early 2012, works on a five-star hotel, serviced apartments, office suites and an entertainment hub will commence. Khoo said the joint venture will invest an additional RM2 million or more in green technology to value-add the development. GLOMAC Bhd’s first quarter net profit jumped 86.5 per cent to RM15.5 million for the period ended July 31 2010, backed by strong sales of its development projects. The company told Bursa Malaysia yesterday that profit contributions mainly came from on-going developments namely Glomac Tower, Glomac Damansara and Glomac Cyberjaya. Stronger sales in Bandar Saujana Utama projects had also contributed to the increase in the group’s profit. Group revenue surged 114 per cent to RM126.3 million, it added. ECM Libra Investment Research has maintained its ''buy'' recommendation on property developer, Glomac Bhd. In a research note here today, ECM Libra said the call was premised on Glomac's three-year earnings compound annual growth rate of 19.4 per cent. ECM Libra said it has raised Glomc's estimates for financial years 2011 and 2012 by 24 per cent and 19 per cent respectively after imputting higher margins. "Our earning upgrade has led us to revised the target price from RM1.87 to RM1.93," it said. It said Glomac's results for first quarter of 2011 (Q1FY11) financial year were above house and market expectations as the net profit of RM15.6 million already made up 33 per cent and 35 per cent of house and consensus full-year estimates respectively. "Its Q1FY11 revenue of RM126.3 was 114.1 per cent higher year-on-year as the Glomac Tower project is now full swing and we expect this to continue given the slew of commercial projects in the pipeline," it said. ECM Libra said Glomac achieved decent property sales of RM80 million in Q1FY11. Unbilled sales of RM585 million would provide earnings visibility over the next two-three years. KUALA LUMPUR: The Al-'Aqar KPJ REIT has proposed to acquire properties in Queensland, Australia from Jeta Garden Waterford Gardens Trust for RM134.91 million. Damansara REIT Managers Sdn Bhd, which is the manager of Al-`Aqar, said on Wednesday, Sept 22 the properties covered 14.753 hectares including a complex, villas and apartments. The properties consisted of an integrated gated residential estate for older people which includes an aged care complex with care facilities known as Jeta Gardens Aged Care Facility, 23 villas and 32 apartments known as Jeta Gardens Retirement Village, and an undeveloped portion of the land. Jeta Gardens Aged Care Facility includes 108 aged care bed places with all ancillary improvements, dining areas, kitchen, bathrooms, nurses stations, lounge area. The undeveloped portion of the land is proposed to be developed to extend the Jeta Garden Retirement Village to include an additional 43 villas as well as to extend the Jeta Garden Aged Care Facility to include an additional 42 places. Damansara REIT Managers said the properties are sited on several pieces of land with a fully integrated road system, landscaping and lake gardens. The total purchase consideration of RM134.91 million would be satisfied by RM67,454,750 in cash and the remaining RM67.45 million via the issuance of new units in Al-`Aqar.